Nathaniel Jiles is a “people-person”; always has been and always will be. From promoting the major conferences of Bishop T.D. Jakes to managing and producing shows for entertainment giants like Clear Channel Communications, Nathaniel knows that people are the common denominator vital to building the bridges that connect other people to life impacting experiences. His knowledge and value of the “people asset” on all levels from service to people, in cooperation with people, and leadership of people, has added to his remarkable success as one of the top promoters, event specialists, and communicators in his field. While the seeds of service were being cultivated by the ministry, Nate simultaneously began exploring opportunities to develop his professional skills by entering the job force. Equally adept in the area’s of finance and money management, Nate worked as a runner for ‘Shearson Lehman Hutton’ on Chicago’s Mercantile Exchange Floor, and as an order specialist for both ‘Ira Epstein’ and ‘Lind Waldock’. He assisted in accounting responsibilities holding various positions with many Christian organizations from a national level with the ‘P.A. of W, Inc.’, to state wide and local positions as well. Later, he worked in accounts payable and receivable at ‘UBM, Inc.’ the largest minority owned construction contractor in Illinois, where his mother Sandra Dixon-Jiles is an owner and co-founder. Leaving employment behind, he started, owned and operated the ‘Polished Apple Hand Car Wash’ on the south side of Chicago before deciding to continue his education at the ‘University Of Illinois at Chicago’ & ‘Roosevelt University’. As Nate’s skills and relationships began to emerge, he entered the in-your-face live action territory of the entertainment industry. In 1993, equipped with no formal entertainment education, Nate began seeking open doors of work with production companies, event promoters, marketing and public relations agencies, and various event management companies. As he began to land jobs, the exposure gave him an interior perspective of the behind-the-scenes environment that is the life of entertainment the industry. Rapidly, Nate began to work with a plethora of industry names like Point Of Grace, Donnie McClurkin, DC Talk, Yolanda Adams, and the Winans family. In 1996, with the desire to enter large-scale tour management and production, he began representing promoters and served as the production coordinator for the ‘Skyline Stage’ at Chicago’s Navy Pier. After a year there he received a call from T.D. Jakes Ministries requesting him to promote their “Back to the Bible” Conference, at the RCA Dome in Indianapolis. From then on his promotional career took flight. Nate’s promotional relationships flourished as he promoted conferences, crusades, concerts, and plays. In 2000 he promoted the “Woman Thou Art Loosed” conference, which is recorded as “the largest assembling of Christian women in North America ever”, and set a national indoor attendance record with over 90,000 women in attendance at Atlanta’s ‘Georgia Dome’, utilizing ‘The World Congress Center’ as its overflow. Applying his aggressive promotional philosophy to “leave no stone unturned”, with a strategy to connect to the pulse of a community, which are the businesses within it as well as the local ministries, events marketed reached new levels of precedence in attendance, worldwide impact, and financial success. In 2003 combining his years of experience, cohesive relationships, and industry presence Nate formed the NDJ Communications Group, a full-scale communications company specializing in special event production & promotion. He created the company to build the bridges and connect the visions that entities and organizations seek to convey to their audiences. In October of 2005, as he continued to develop ways to reach and impact people, with an ever-increasing affinity for service, Nathaniel birthed Nationwide Ministry, communicators for the Kingdom, a company whose focus is to connect the Body of Christ through online communication. Highlighted by their signature eBlast services which reaches 10,000’s of Church & Community Leaders from coast to coast, they now have in excess of 80 walls, boards, pages and sites that reach 100,000’s of recipients. 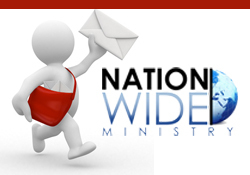 To date Nationwide Ministry ads have been seen by over 33,000,000 individuals around the world and they continue to serve 100’s of clients. Nathaniel currently resides in Indiana with his wife Shalonda and his son Nathaniel II, they attend as active members of the Apostolic Faith Church in Chicago, Illinois where Bishop Horace E. Smith is Pastor.